As you drive through the gate at Coconut Bay Beach Resort & Spa, the blue ocean and grassy lawns with palm trees greet you. In the lobby, the hostess welcomes guests with a glass of champagne for adults and fruit juice for children. Like many moderately priced resorts, the roofed, open-air lobby has something of a cavernous, camp-like feel even though rattan and upholstered couches create comfortable seating areas. While checking in, be sure to admire the views of the pool from the lobby. 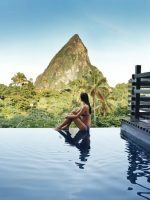 Since the drive from Hewanorra International Airport, St. Lucia’s main airport, is only five minutes, making it from touchdown on the runway to splashdown in the ocean can happen in record time. 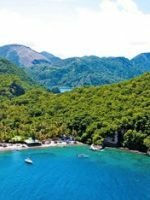 That’s a bonus for weary travelers, especially on St. Lucia, an island known for its twisty, slow-driving roads. 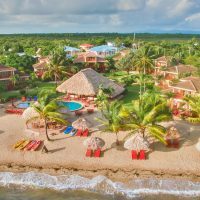 As the resort’s marketing materials emphasize, the property offers “two worlds in one,” each in different areas: Harmony for adults and Splash for families. Along with lodging, Harmony features a quiet pool, a bar and a beach. Splash, has a family pool, water slides, lazy river, children’s club and beach. In between, guests mingle on common ground — the lobby, main restaurant, an activity pool, beach grill and Buzz, an entertainment section with ping-pong tables and a stage. 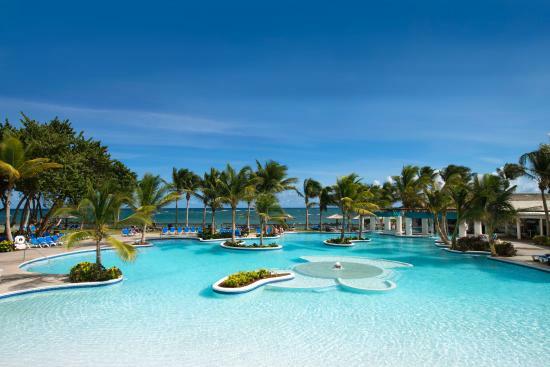 At Coconut Bay, adults may avoid children during the day by hanging out in the quiet pool and snoozing in a lounge chair on the adult side. And, with 254 rooms on 85 acres, Coconut Bay offers plenty of space for all. 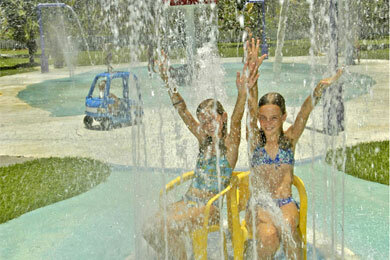 In addition, the resort’s daylong, supervised children’s activities keep ages two through teens happily engaged. Infants through tots are cared for at the nursery. Coconut Bay Resort sits on land that formerly housed a Club Med. After extensive renovations and additions that included the water park, lazy river and the spa, Coconut Bay reopened in March 2004. 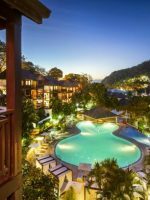 Located on the southern tip of St. Lucia near Vieux Fort, the island’s second largest town, the resort lies on the Atlantic coast side of St. Lucia, where you can swim in the water off Coconut Bay’s Beach. 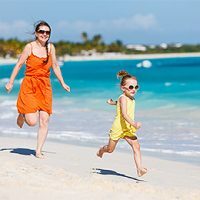 While at Coconut Bay Resort, you won’t have a marble bathroom or room service, but you will have a comfortable (if not stylish) room, lots of good food, a friendly staff, plus activities to do with your kids as well as without them. Families lodge in the coral-colored Splash wing and adults without children stay in the lime green Harmony wing. Each wing consists of two, four-story buildings. Elevators access floors in both wings. The guestrooms are basic, but comfortable for two adults and one or two children. Consider a second room if traveling with teens; depending upon availability and season, Coconut Bay may offer a deal on a second, adjoining room. Up to four people may stay in a room, or five if the fifth is a baby. However, adding a crib would make the room tight. The colorful decor in the Splash wing generally features coral-painted headboards, either twin or queen. Twin rooms have beige wicker settees. Queen rooms have a blue pullout sofa that accommodates two children up to age 10. All rooms on the second through fourth floors come with balconies that have high railings and two chairs. First-floor rooms feature patios and lounge chairs. Although all rooms face the ocean, those on the first and second floors may have views of the water obstructed by buildings or palm trees. Accommodations on the fourth floors offer the best views as well as a more spacious feel, since fourth-floor ceilings are high and sloped. Most of the rooms contain the same, simple bathroom: white tile walls, blue vanity, toilet and shower. All of the guestrooms feature a mini-fridge, flat screen television, air conditioning and coffee maker. On the fourth floor of the Harmony Wing, there are premium rooms. Although the bathrooms are standard, the rooms' more sophisticated furnishings include sleek, dark wood Parson's-style desks and tables, dark wood and wicker headboards and low gray couches with silver throw pillows and a dark green accent wall. These rooms also have refrigerators that come stocked with water and soda. So if Grandma and Grandpa want spiffier accommodations, book them a Harmony room. We chose this hotel based on a friends recommendation (she went with a large family group), but we stayed in the adults-only, Harmony section of the hotel. We also opted to upgrade to the concierge level, so we could be "treated" on our trip. It was well worth the extra money. I, along with 5 others in our group, was celebrating my 50th birthday (SIXTY-NINERS !!!!) with 13 of our other closest friends. The staff was incredible, from the greeting with cold drinks upon arrival from the airport (5 mins maximum), arranging seating at all the dinners through the week for us, and presenting an amazing birthday cake for celebration time! Beach - long, soft sand, yes seaweed but the tractor is always pulling it away, and it's really not THAT bad. Best area for quiet (I hope I don't spoil it for anyone) is down the beach at the resorts Paradise Beach club. Plenty of loungers and shade there, along with a bar and bathrooms. Can't beat it ! Nice there isn't a haggling from vendors either - they tend to keep to themselves in their areas, and let you approach them. Pools - a plenty - the lazy river and waterslides were a hoot even for us big kids! Activities - also a plenty - but geared more to families (and that's GREAT). The weekly hike up to Quarry Hill was tiring, but So worth it for the view !! Gotta do it. There was also plenty to places just to hang out if you didn't want to participate. Night time around the 2 fire pits was a great place to chill. Theme nights were fun (although for country hoe-down maybe more upbeat country music would be in order), sad I missed the beach party due to pure exhaustion (heard it was fun). Rooms - great view in oceanview room. I'd imagine even 1st/2nd floor gardenview would be nice as well. Faces the same way, just not as high up to see the actual ocean (no rooms face inland). Comfortable beds, clean linings, and housekeeping does a great job. Dining - unlike many all-inclusives, the options at the buffet here actually CHANGE. Not the same old same old. Mary makes the BEST omelettes, there are cooked to order french toast/crepes/waffles too. Can you tell I am a breakfast person?? Despite there only being 2 a la carte restaurants (Silk and The Calabash, both amazing), there is not shortage of choices. Flip-flops is a seaside grill to grab lunch/late night snacks and the other half of this area, Seaside restaurant, is open on certain nights for dinner. The Jerk Treehouse serves INCREDIBLE jerk chicken/pork and side dishes. Make a visit to the chocolate buffet too, if you have any room left for sweets - incredible to see. What else - excursions - they will help, but check out FEEL GOOD WATER TAXI AND TOURS if you want a GREAT experience on the island. 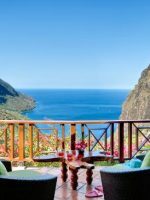 Enjoy St Lucia! we hope to be back one day! bad point ... the beach has seaweed and is quite small. This is the only thing I can say negative about coconut bay. Good points... staff is friendly and very knowledgeable. Rooms are very nice air is very cold !! Food was some of the best resort food we have ever had. Drinks were plentiful. Room looked spotless every day when we returned. Turn down service at night was a plus !! We will certainly stay hear again !! The resort's water features delight both kids and adults. The water park consists of three elements, all on the Splash side of the property. Two you can't miss: the lazy river and the slides. Grab an inner tube and float along the 3-foot-deep lazy river. Twist down a high slide or glide down a short one into a shallow pool. Inside CocoLand, the children's camp, kids romp through a water playscape with a mushroom fountain, spray guns, jets and bucket dumps. Typically, counselors turn on the water elements for an hour at 11 a.m. and 2:30 p.m. Even if your children aren't signed up for the Kidz Klub, you and they are welcome to splash around -- just bring towels. The water playscape anchors a wide grassy play area featuring swings, climbing equipment, a sand pit and a mini zip line. 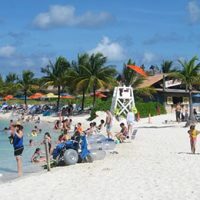 Coconut Bay claims that CocoLand, the children's facility for infants and kids 2 through 12 -- broken down into age group to keep little ones together and bigger ones doing their own fun activities -- devotes the most space to kids of any family-friendly resort on the island. Counselors greet kids in the air-conditioned main room, colorful with its rainbow-striped couches, and red kid-size tables. As a welcome gift for signing up, children receive a canvas bag, water bottle, T-shirt and cap. 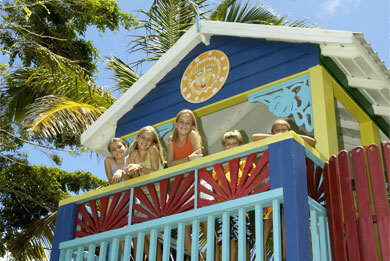 At the outdoor yet roofed art area, children paint coconuts, decorate items with glitter and create crafts. Along the adjoining, wide corridor, also roofed but open, toddlers pedal bikes and scooters. Lunch with the group is optional Monday through Saturday. On Sunday, kids dine with parents. In general, CocoLand offers supervised activities from 9:30 a.m. to 8:00 p.m., 8:30 p.m. or 9:00 p.m., depending on the day. At the separate, air-conditioned nursery with porta-cribs and couches, counselors take care of infants up to 23 months from 9:30 a.m. to 5:00 p.m, with breaks at mealtime. There's no extra charge for scheduled infant care as at some other all-inclusive resorts. In addition to the water features, the resort has three pools plus a kiddie pool. The family pool has a zero entry, great for tots. There are no lifeguards, although pool attendants are certified in CPR. Even though Coconut Bay fronts the Atlantic Ocean, typically rougher than the Caribbean Sea, the boulders that the resort placed offshore of the family beach serves as a breakwater, mitigating the waves. The beach's gradual slope means that the ocean remains relatively shallow (about 3.5 feet deep) for a good distance. While not lined with shells or rocks, the ocean in front of the resort does have a good deal of sea grass. The turtles like it and in season, some do come ashore to lay eggs. If you can get your kids off the beach and out of the water park, they may be interested in playing tennis, soccer or basketball. Ages eight and older can sample kite surfing (lessons cost extra). Those 12 and older can battle it out on the paintball field. The Teens Club for ages 13 and older features foosball, billiards, videos and couches for lounging. When the number of teens in the house spikes, the club may have a facilitator to help get teens to meet and mingle. When at least five teens sign up for off-property tours, they can go kayaking, horseback riding and take island tours (for an additional fee). Like many all-inclusives, Coconut Bay hosts theme nights. Listen to jazz and learn salsa dancing; toe-tap and Texas Two Step on Country and Western Night; and sway to steel band rhythms and join in an island limbo dance on Caribbean Night. 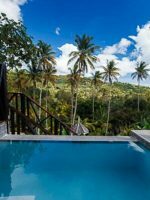 The resort books many excursions, including jeep, bicycle and hiking tours, plus day trips to the island's volcano, billed as the "world's only drive-in volcano," since you drive into the collapsed caldera. At the Botanical Gardens, stroll through the garden, lush with palm trees and ferns and blooming with heliconia, lilies, ginger and many other flowers. Coconut Bay's food, in general, is good. The food isn't gourmet, but it doesn't pretend to be. Some days the steam table fish is a bit dry and other days it's moist. All meals, drinks (alcoholic and nonalcoholic) and snacks are included in the all inclusive rate. 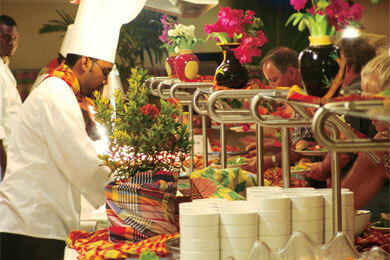 Coconut Walk, the main dining area, serves buffet meals three times day. 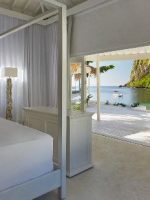 There are enough choices even though Coconut Bay offers fewer selections than at a larger all-inclusive such as Club Med. A chef always cooks eggs to order and the buffet line offers pancakes, French toast and breakfast meats. For lunch and dinner, in addition to salads and fruit, there's always a carved or cooked-to-order item such as steak, seafood medley or chicken fajitas. Check out the buffet's "local corner," featuring island specialties such as stew or lentils. At the Children's Corner, a kid-height buffet, children can serve themselves two entrees such as macaroni and cheese, chicken tenders or spaghetti with meat sauce. This Italian restaurant features both indoor and outdoor seating. The kids will love the hand tossed pizza. Open for dinner only, reservations are required. Beach Grill serves burgers, chicken, wraps, pizza and salads from about noon to 5 p.m. 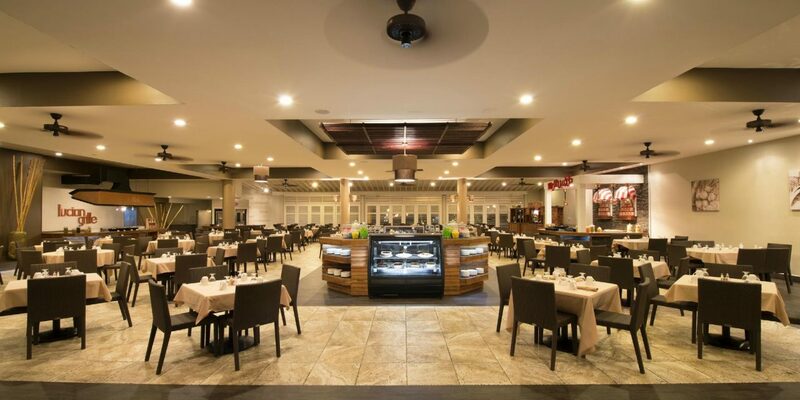 Silk, serving Asian fare, and the adults-only Calabash, serving Caribbean cuisine, are the specialty restaurants. Neither costs extra, but reservations are recommended and resort evening attire is required. Families may dine at Silk at 6 p.m. and 6:30 p.m. Adults without kids take the later reservations. Complimentary Wi-Fi access can be found within the concierge guestrooms only and the hotel lobby. A fee applies for Wi-Fi in all of the other guestrooms. Babysitting is available by reservation at an hourly rate. The fitness center feature cardio and weight machines as well as aerobic classes. The resort can book a variety of island outings for you and your family. High season runs from about mid-December through April. Shoulder season consists of May, June, July, August and early December. Low season runs from September through November. Many airlines fly into Hewanorra International Airport at Vieux Fort on St. Lucia's southeast coast. 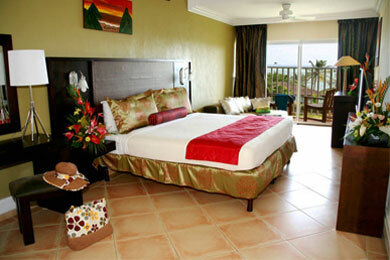 The Coconut Bay resort is about a five-minute drive from the airport. Airport transfers can be scheduled through the hotel and are included in the all inclusive rate. Harmony has a quiet pool -- no rock music blaring and no children. If you want some R&R when your kids are in the children's program, sunbathe at Harmony's beach or pool. At Kai Mer Spa, pamper yourself with a massage or a pedicure (they offer a superb spa pedicure).